If you have come here for the first time, let me explain . . .
As you may already know, I am a retired Broadway stagehand - retired due to an accident in 2006, at The Lion King, where I nearly broke my neck. At the end of March, 2010, my wife and I re-located to the Philippines where she is from. We are currently renting an apartment in Surigao City on the southern island of Mindanao. Life in the Philippines is very different from life in New York or even Ohio. This webspace was created to share those differences. I will post things randomly. Check back from time to time. Anyone and everyone is welcome to come and visit. It is a unique adventure you will either love or hate. Unfortunately it takes two days to get here from New York and two days to return. So weekend trips are out of the question. If this is your first visit -- scroll down -- and start reading from the bottom of the page. We are moving. Can't stand it any longer where we live in Surigao. Neighbor who own a pack of dogs barking all night; foraging for food through everyone's garbge; shitting everywhere. They also have roosters cackling all day. And they say they can own as many dogs and roosters as they want. It is their right! And then there is the construction of a new apartment building across the street. and start building another apartment building. Taking down the old cement structure requires hammering and chiseling non-stop for 8 hours a day starting at 7AM. The road in our little Village is terribly rutted with potholes and no one is fixing them. My car suspension is nearly shot. One hole is half the size of the car and a foot deep. Rain water remains in the potholes for several days. Breaks get rusty. Then there is the MALL that is being built next to our little Village. Reeking havoc on the road leading to our Village. Not to mention all the big construction trucks and earth movers and noise. Plus there just isn't anything to do here in Surigao. No movie theatre. No live theatre. No shopping till the MALL gets finished. Only about 6 restaurants. We've eaten in all of them repeatedly. All we have for fun is sitting on a park bench at either water's edge or in the city park. So we are moving to Cebu. A bigger city with a lot more stuff to do. We have gone to Cebu 3 times over the last few months - looking at houses. Seen about 25. There was one we found online that we loved - but when we got there it had been sold. Each trip to Cebu costs money - airfare, hotel, food. And it's hard to cart Dominick around while we are looking for houses. So we decided we'd just find an apartment in Cebu to live in temporarily, while we continued the search for our dream house. We have given our notice here where we live. And we hope to be gone by the end of August. Being in Cebu is more convenient for anyone to visit because they have an international airport. And easier for when we want to go elsewhere also. Cebu is close enough that the family here can visit easily on a passenger boat. So, anyway, that's it in a nutshell. We always have the same email and are always on Facebook. We will keep you all updated when we find our apartment and, later, our house. Dominick is getting big. He and Rap Rap (his cousin) are fighting over every toy. Dominick will be walking soon. Right now he is real crabby - wants his Mommy all the time. we had Chona's birthday, Clarence's birthday, Cecile's parents anniversary, Arnold's birthday and Cecile's mom's birthday - all before New Years! Dominick was ogled and fawned over everywhere we went in town. We had a quiet Christmas - no snow and 80 degrees. and other brother from another father. We weathered a monsoon for 8 days - of non-stop rain! All the other people from 3 other apartments in our little building moved out. don't get me started on the midterm elections back in the states!! Mommy and baby are doing fine. In the Philippines "tisoy" means "handsome"
Cecile is due late September / early October. We are actually hoping that he (yes, it's a boy) will arrive on my birthday October 1st. All is progressing smoothly. He is a very "busy" child - inside his domain. It's a Nissan Presage. It is a used car - 125,000 miles. It seats 8. It is from Japan - that is, it was shipped from Japan after they moved the steering wheel from the right to the left. It's in real good shape. It cost $6300. We are having it tuned up, touched up, spit on and polished and it will be good as new. Cecile loves not having to walk to the highway to flag down a tricycle. I love not having to scrunch myself into the small tricycles and multi-cabs for out rides into town. Shopping is easier. and "Mitsy" the little tiny gecko lizard who likes hanging out in our sink. and even beginning to grab things. "Mitsy" knows her job - find and eat the ants and spiders. This is the new finished store in Sering where Cecile's parents live. sugar, salt, juice, candy, cigarettes, vegetables, soda and beer, etc. Behind the store will be the Movie House with the 50" flat screen TV - showing DVD movies. Hopefully it will be finished by the end of August. It's all income for the parents - and they are very busy. When we left Manhattan Plaza we were paying $2096 for 2 bedrooms, 2 baths. That's about 15% ! ! In my whole life I never had to pay a water bill. Now I do. Is has also been a long time since I had to pay a separate electric bill. Our electric was included in our Manhattan Plaza rent. The ride takes about 2.5 hours. Summary: It is much cheaper to live in the Philippines! Sering and the new arrival. We went to Sering, on the small island, for Clarence's graduation from kindergarten on 5/19. While we were there, Chona went into Labor. She was still back in the apartment in Surigao City with her boyfriend Ryan. 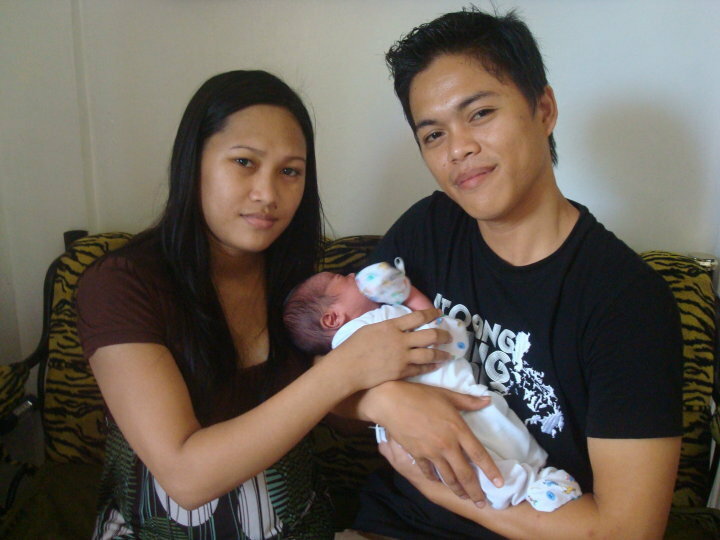 We went back home on the 20th and that evening Chona had the baby - Ralph Aaron. These are 2 photos of a small village we stop at on the way to Sering. A good view of how many village houses are built on the water and the town's people greeting the boat - the big even each day. 2 photos of the Movie House Cecile's dad is building - that will house the big screen TV we are having shipped here, and earn them income. The movie house sits right next to their house. It should seat 80-90 people hopefully, at 5 pesos per person that's 400-450 pesos per movie; approx. $8-10. Good income per day. 2 photos of the house we built for Cecile's parents (her father built it we just paid for it.) It was a lot more "filled" than when we saw it last. More toys and clothes and stuff. Clarence at graduation with Janice, Denshu & Zildjian. This is the outside community area with a small stage for all these type of events. There were approx. 75 kids getting diplomas. Their mother's made their gowns and hats from scratch. And the new baby boy. Ralph Aaron. The city streets here in Surigao are filled with the tricycles. There are no traffic lights. There are a few cops at the two or three major intersections directing traffic, but otherwise it's a constant cluster of people and tricycles trying to get anywhere. feed their families. It doesn't seem like these street vendors are regulated. But the same ones have their tables in the same places all the time. all the stores lining the streets. There are only a handful of restaurants. They pretty much all serve traditional foods - fish and pork and chicken. There are only about three or four fast food places - one called "Jolli Bee" is the most popular with kids. No McDonald's or Pizza Hut or KFC. No Sushi. No Chinese. And no American (whatever that is). Definitely no Indian, Pakistani, Hungarian like in NYC. The brown-outs hit the downtown area as well. Many store have generator and some of them are really large and sit on the sidewalks. So it is very noisy as you walk down the streets. not very big. I have had to adapt my eating regime and preferences. No sushi!!! There seems to be a plethora of cell phone stores. Everyone has a cell phone. This is how everyone communicates. You pay as you go and can "load" your phone with time for your text messaging. Very few actual phone calls - they cost too much. But only the caller is charges, unlike in America where both caller and called are charged. The conversation at meals is usually in Surigaonon - their local language from the island. Occasionally things get translated. I have asked that at meals more English is used, so everyone gets used to speaking English (they all learned it in school) but it is easier for them to speak their language. I am picking up a few words - especially if reference to talking to the little boy. Zildjian is a typical 2 year old. Always moving and always doing something he shouldn't be doing. And when he doesn't get his way he screams louder than I have ever heard a child scream. He is getting used to me, though. He calls me "Um Bo" which we think is baby talk for Uncle Bo. Technically I am Tito Bo (Uncle Bo) but he chooses to call me Um Bo. watch the TV shows and movies that I have downloaded. Chona and Janice have never seen most American TV like House or Fringe or Americas Next Top Model or Amazing Race. They enjoy these shows. corner to a smaller place and rent this apartment out. We have chatted with our neighbors. They all have to pass by our windows to go up the steps to their apartments. Our apartment is sort of modular in nature. The living room, dining room and kitchen each occupy about 10 x 10 feet of space. Each of the bedrooms are also about 10 x 10 ft.
way it is. One pipe comes into the house. Filipino people are used to taking cold showers. Brrr! It's pretty quiet in our little village. There are approximately 25 houses. We have the kids upstairs and there are other neighborhood kids along the street. Last week we took a bus south to a city called Butuan. We were looking for a new sofa. Didn't find anything. The trouble is that the furniture is built for small people. Everything is low to the ground and the seats are small. I don't fit in much. And the things I fit in are too big for the space we have in the apartment. The furniture store in Butuan was in a big Mall. Lot's of people and lots of stores. The bus trip was about 2 hours each way. Cecile threw up 3 times on the way down but was OK on the way back. We learned to always carry plastic bags. practice or use it much after school, so there are few people I can talk to. Store clerks are generally OK. Cecile's mom knows a little English but her father knows none. Her father lost his parents at age nine so he dropped out of school to work and feed his siblings. We don't talk. have to download all the TV shows we want to watch. The internet service is real slow. Pages load OK but my downloads are a fraction of the speed I was used to. So we are really far behind, by a couple of weeks, watching our favorite shows. lights. So we have absolutely nothing to do but sit in the living room with a candle and stare out the front door into blackness. The brown-outs happen because the hydro-electric plant that serves our city is low on power due to the lack of rain. When the rainy season starts in June, we probably will have few if any brown-outs. The washing machine box on its side. chorus begins around 6:30am. So by that time I have had my 7 hours (we generally go to bed by 10:30 - 11pm) and I end up laying in bed listening to them and the birds chirping. the sink. Also a plastic mirror. There is a small window above the toilet with a screen but the small ants can still come in. The plastic toilet seat doesn't stay up, so I have to hold the toilet seat up while I am doing my thing - or sit down. It's different. get some air circulating. The windows have stayed open all night but it is still muggy. I am usually the first one up. I start the water for coffee and then have my vitamin with some TANG - Cecile says she will buy me some real OJ soon. I will generally do my morning stretches while the water is heating up. This whole routine is pretty much the same as New York - except for the TANG. When the coffee is ready, I get my cup and retire to my "office" in the fourth bedroom to check my email and over night downloads. to her room. Chona never says much and she spends a lot of time in her room. She does do the dishes, though, and that is a great thing. She is due at the end of May! If Janice and her 2 year old Zildjian are here, which is usually the case, they are up next. They also stop my the "office" to say Good Morning. The baby says "Hi." Janice gets something for the baby to drink and begins to get things together for breakfast. Janice is our cooker. This is also great. She speaks pretty good English as well. nights dinner (common). Sometimes there is fruit, usually fish, maybe some bacon or hot dogs. After breakfast we clean up. If the brown-out has started we sit around till it ends. Sometimes we may need to go to town for shopping. We try to do it when there is a brown-out. Then around 1:30pm we have lunch. This schedule is very different for me. I have usually eaten my breakfast around noon and then dinner at 7PM. I haven't had three meals a day like this since - I don't remember. Maybe in college. The table is large - with 6 high back uncomfortable chairs that squeak when you drag them on the tile floor. One of the first things we did was buy cushions. And recently I found some glides for the bottom of the legs. It helps. The bathroom in our bedroom. Behind the door is the wall with the shower. Zildjian is Janice's second child. Janice is Cecile's sister (2 years younger). Zildjian's father Denshu is a singer who is a member of the city band in a different town and wasn't able to come for the beach party. We are at the ocean's edge at low tide. Other people in the various photo's are pregnant Chona (Cecile's other sister); her boyfriend Ryan; Cecile's mom (Natividad); a friend and Clarence (Janice's first son). Lot's of food, a cake, walking on the gray sand, sun and beautiful vistas. The shelters are rented for the day. You get around here in one of two basic ways. The "multi-cab" which is small van with 2 benches in the back. They are built for small people. You can see how cramped I am inside. And then there is the "tricycle." This is a motorcycle with n extra side wheel and a framed compartment built over everything. 2 small people can sit in the front next to the driver. Or you can sit in the back on the 2 small benches. It is hard for a big guy to get in these. And I have to sit hunched over. The cost for a ride is approximately $.17. The multi-cab travels on a set route and you can flag it down or get off anywhere. One price for any ride. The tricycles go anywhere you want. It's a little more expensive between our apartment and town because the drivers don't want to go out that far. The tricycles are very noisy. Originally, Cecile was going to be staying with her sister and I was going to be jetting back and forth from NYC to the Philippines (part of the long story). When we lost the NYC apartment, we needed to find a different place to live. Fortunately, Cecile's sister was lucky to find a fully furnished apartment for rent in Surigao City. She contacted the owner and went to the apartment to check it out. It was perfect for our temporary needs. It also meant we would not have to live in a hotel while looking for a place. While we were on route, Cecile's family cleaned the apartment and purchased a few basic items such as dishes, glasses, pot & pans, silverware, toilet paper, dish towels and basic food. When we arrived, the apartment was already set up and we moved right in. It is a four bedroom. 3 bathroom apartment. The rooms are small but adequate. Cecile's pregnant sister will be living with us. She is due at the end of May. We also have a guest room for other members of Cecile's family as well as a spare room for storing our shipped stuff and used as an office. The entire apartment plus utilities is approximately $400 per month. Unbelievable, unbeatable. The apartment is the bottom floor of a three floor building. There are two apartments on the second floor (a 2 bedroom and a 1 bedroom) and another 3 bedroom on the third floor. An American from Minnesota lives in the 2 bedroom on the second floor. The landlord put in a hot shower and AC in our bedroom. Because Americans are not so used to the heat and the cold showers. And we also have fans. The temp has been around 90 during the days. We also bought a washing machine for all of the laundry. They don't sell dryers though - it all gets hung outside on the line. The photos show: The street where we live; our building; the first floor (car is not ours); our living room; our dining table; kitchen; our messy bedroom with bathroom inside; the extra bathroom & shower/laundry room off the kitchen; me in my "office"; the laundry line; the neighborhood farm with grazing cows; me and my friend. I have internet through a local wifi company. there is a "dish" on our roof and a wire coming into my "office". We have TV cable but I don't get some of my favorite shows. There is no MSNBC!!! All I have is Fox News and can't stand watching O'Reilly and Hannity and all their distortion. I will need to get Hardball, Countdown and Rachel via the internet. Also miss Comedy Central. I always watched John Stewart at 11PM every night. We download our favorite TV shows and watch them from the laptop that I am able to hook up to the TV. The apartment is a 5 minute walk from the nearby city bus terminal. This is convenient for trips to other cities, as well as being able to pick up some basic food from the terminal lunch counter (when we don't want to cook.) It is also near the city airport. We are about 10 minutes outside of town. Far enough to avoid all the hustle & bustle, yet close enough to run in for grocery shopping etc. It's a small neighborhood, and we know the people in our building and some from across the street. There are birds and trees around the apartment. It's sort of like living in a small farming community outside of town. Very rural. We arrived in Manila after stop-overs in L.A. and Taipei. A long flight - approx. 30 hours. We always stay in the same place when we go in and out of Manila - Euro Apartments. They pick you up from the airport, the rooms are comfortable. They take you back to the airport. Cheaper than a hotel. There is no direct connection to Surigao City on the same day. This time we spent 3 nights in Manila. We wanted to do a little shopping in the big Mall of Asia. And I had to get my Permanent Resident ID card. Our room is really a one bedroom apartment. The Mall of Asia is the largest mall I have been in - complete with indoor ice skating rink and guards who search you at the entrances. That's me outside the Immigration Offices with my new "Green Card." And my feet getting a pedicure at the Mall of Asia. We had been talking about the move for some time. I had not worked since my accident in 2006 - collecting Social Security. Cecile was working in merchandise on a few Broadway shows but not making a lot of money. We realized that our financial situation would be a lot better in the Philippines where the dollar goes a lot farther. We began planning the move early in 2009. We had an apartment sale. Tons of stuff went to the Salvation Army. We had to wait until Cecile got her citizenship by naturalization - so we could travel back and forth with ease. She became a citizen the first week in December 2009. And then Alex moved back home unexpectedly. So instead of our vacating the apartment, we attempted to get Alex classified as the head-of-household and applied for his friends to move in as roommates. On the day before we left, we were denied both applications - long story. Most of the furniture went into storage because Alex had to move in to the friends apartment. We had initially got all of Cecile's stuff into 10 boxes, 2 flat screens, 1 wall art box and 6 pieces of one of the wall units I built. Then after we actually left, Alex had to ship my stuff (part of the long story - it's complicated). Our whole life in boxes. But we were heading for a simple life and I had come to a place in my mind and heart where "things" didn't matter much anymore. Special things - yes. But not "things" for the sake of "things." We had to pack suitcases for an "extended vacation" so that we would have essentials to live on for an indeterminate time - clothes, personal items, toiletries, laptop, etc. We left New York on Saturday, March 27th, 2010. I was planning to return (also part of the long story).